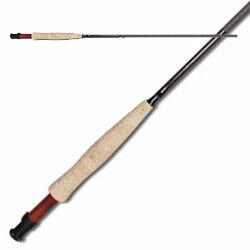 Today, the graphite fly rod is the top choice among fly fisherman the world over. It is light in weight, relatively inexpensive, and bends without snapping. The fly rod's intended use is mostly for trout and salmon. This is not its exclusive use as fly fishing for species like bass, pike, and panfish are also caught on the fly. And of course, let's not forget the major saltwater species like the tarpon, redfish, permit, and bonefish that are caught and released in the Florida keys by the tens of thousands each year. Graphite fly rods are produced in many sizes and weights and for different conditions and purposes. The "Weight" of the rod (a number used also to match the line with the rod) generally ranges from 0 to 15 depending on whether you fish for bluegill or blue marlin. Rod size also varies from 6'to 15'. For small streams, use a shorter rod; for the big bruisers you'll want a longer stronger rod to load your line and play the fish. If you've never tried the "art" of fly fishing you really must give it a go. In a couple of hours you can be proficient enough to present your fly and hook a fish. Once you've caught fish on the fly, you'll be hooked yourself. Graphite is a mineral which is made of carbon. Carbon just happens to be the basis for all life on the Earth. Graphite, not lead, was originally used in pencils for writing. It was named by Abraham Gottlob Werner in 1789 from the Greek γραφειν (graphein): "to draw/write". Today, it is still mostly used in the manufacture of pencils. Rods are made with different amounts and grades of graphite and often times other materials such as boron and/or titanium are incorporated into the rod to give it certain properties. Fly fishers use these composite rods because they may have better strength versus weight or because they may load or handle differently than stand alone graphite rods. Such composites may or may not be of any advantage to the "average" fly fisherman. Many people try handcrafting a rod in their own garage. They buy blanks of graphite and begin the long labor-intensive process of making their own dream rod. Bamboo rods can also be made from scratch at home. For comprehensive information about making a bamboo rod, click here. Whether you buy or mold your graphite rod from scratch, the choice is yours. Remember our motto: Research, Research, Research before taking the plunge. Please view the video below from T.V. 's "Hows It Made" for the manufacturing process.